Just a few shots of a little Bobber made for a QLD customer.It rolls on 20x3"rims with a rear coaster,full size Stingray seat,15" bars and a tripple tree front end.The Colour is a Pearl clear over custom Valspar white frame with black cranks, rear, gaurd,bars and fork legs and chain wheel.Not much sun in Wagga today to get the full effect of the pearl but it really pops! Thanks mate glad you like it. another triumph, Awesome work Rob!!! Thanks Glen,ummm depending on spec $800 and up.This bike was made to suit a rather "compact frame" rider so it is shorter than some others I've built but still comes in at 2100mm long,500mm LOW at the seat and 1150mm high at the bars.There is a hell of alot of hrs spent on em and no 2 are ever the same,so you pay for originality and my alcohol dependancy. Someone will be very Very Happy!!! Thanks bud,yes it's very time consuming but personally very rewarding too.I don't think I could get one to drift like your Falcon doe's though. looks good rob, you tried selling any on ebay? theres not many ppl around who make these kind of pushies. if i have kids, thats what they will be getting, a rob special. Wow its for me hey Rob-Im stoked i cant wait to get it..How can i ever thankyou enough for this?? Shes going to look TERRIFIC next to my Arctic white XF!! Tell ya what if I throw in a bike will you take my kids? Well you could thank me by riding it,that would be thanks enough. :hy:Hope you like it Carls. I do i do i do...I will ride it with Staids and his sled..Im soooo Happy!! Sorry, but I cant stop looking at it Rob! put them on ebay than they wont be so rare and unique and other people wil start gettin ideas. I say leave them for friends, family and the xfalcon community. Just think you will lose that personal speacial touch if hey made them for everyone. Good old eBay,problem with eBay is everyone wants a bike for $100.I pay around $250-$300 for the parts that go in em!Thats before prep and paint and hrs spent on em too.So you can see I don't make alot off em but I like making em and selling em to the right people,people who ride em. I'd like to keep it as relaxing pastime not a job as such and pick and choose who they go to. 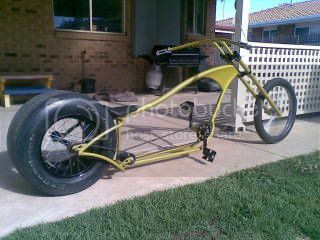 Cool stuff, i like the frame work, how much to the front fork pivots usual sting you? I have had an idea for a while now of building a full scale chopper but using as many xfalcon parts as i can incorperate into it, Like i want the rear to be a single leg probably out of box 3x2 with about 8" of an axle end at the back so i can bolt on a disc brake caliper setup and use a 12 slotter i have here with a 245 on it, full open faced wheel on the right side so i can swapp mags easily if i want a change and the brakes and cogs on the left, i have mapped it out on paper and it will work fine how ive designed it but i really need a pipe bender so i can get a start, i want the seat as low as i can get it just in front of the rear tyre and a tallish pivot point for the front forks, I want it peddle powered at first and will try to utilize a 10 speed setup so i can peddle it LOL but i want to build it all full scale to take a small motor aswell, nothing too big but just something to cruise slowly with. 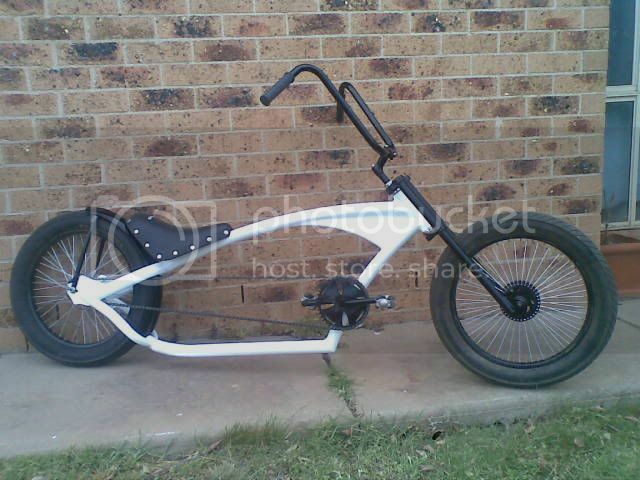 Something like this shape but not as tall at the front and the forks layed out more flatter so it super long. Atomic Zombie,my brother in law sent me a link so I made my own then. So you want to make a single swing arm bike with a car hub to carry the wheel and weight of it.Would work real easy but I don't like the motor Idea!Make a motor bike or pushbike as a motorised pushbike is Illegal if the motor creates over 200watts of power.So it would need to be a minute petrol engine or a limited electric engine.Make a motor bike if you want a motor bike not a engine driver pushbike.Rant over! My advise is make a pushbike and use motor bike rear tyres.They steer and handle alot better than the flat car tyre.Sure they look hot and go super fast down any slight grade but they handle like push bike with a car tyre!Ask McQueen how they go.If it's just a looker more than rider stick with the car rim idea but use tube not RHS as it's stronger and better looking anyway.A single piece of 50nb 3mm wall mild bent to shape would be more than enough.Use a trailer hub to mount your wheel and a modified motor bike chain wheel that acts as your disc also.Some brands have em stock so get out to the bike wreckers and start scounging.That way you get the caliper and other needed stuff that it come off too. As for a pipe bender you can use a oxy to make the bends.Cap the ends of the steel and fill em with dry sand then heat and bend,take forever but you get good results if done right.Or you could just take your tube to a fab shop and get them to bend it for you to your specs. I only use push bike bits except that for bars sometimes.Pm if your need some info when you get started bro. Edited by slydog, 29 October 2009 - 09:47 AM.